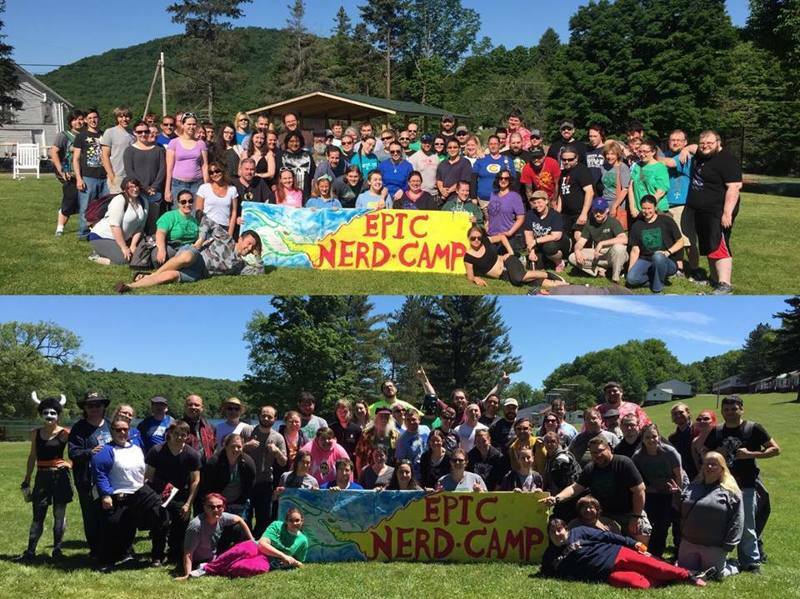 A couple of weeks ago, I had the opportunity to go to a new adult summer camp called Epic Nerd Camp out in the Poconos in Pennsylvania. It was so much fun! As an "alpha" camper, I attended the first session of two. It lasted for 4 days, and was filled with so many exciting activities. 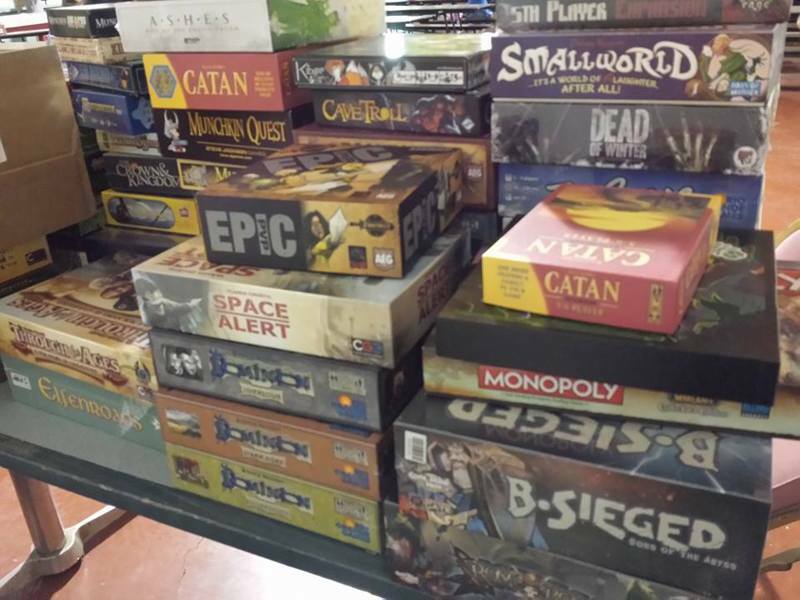 I thought I was going to spend most of my time in the game room, playing boardgames and making new friends with my fellow campers. Boy, was I wrong. They provided tons of activities for all of us, including archery, circus activities, arts, crafts, kayaking, swordplay, light-saber training, LARPing, and so much more! On the first day, I went down to arts and crafts right after breakfast, and spent about two hours perfecting my magic wand, then followed that with circus activities! At the circus, I learned about silks and the lyra hoop (both aerial activities), then I learned how to twirl a staff like the pros. I learned that I really need to work on my upper body strength before next year so that I can take on the aerial activities. They also had a unicycle, a balance beam, and pool. 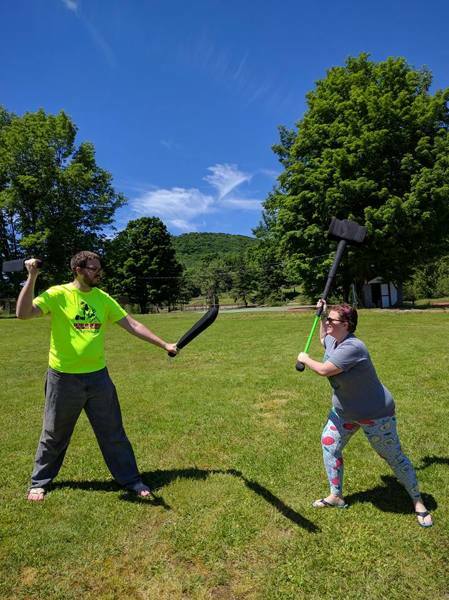 My husband, Chris, spent his time in the swordplay and LARPing areas, learning how to fight properly with a blade and a light saber, and then took part in the big LARP that was just for the campers. At one point, when I was headed back to the gaming room, I got wrangled into a game of Quidditch. I had never played before, and I had so much fun! We actually had a couple of campers who had played on their local university teams, so there was good knowledge to be shared. I did manage to play some games while I was there, though. On the first night, I encountered a group that had only attempted Munchkin Quest once, and gave up because they couldn't understand it. Fortunately, I was there as a MIB to show them how! I taught them, we played through, and we had great fun. All I'm saying is this: If you find yourself available to attend a session of Epic Nerd Camp next year, please do yourself the favor and GO! I had so much fun, and we've even kept in touch through the Facebook group. I made so many new friends, and was surrounded by "my people." Eventually, the owners hope to have a camp on the west coast as well as the east so that nerds all over the country can join in the fun!